We have the rain to thank for the resurgence of the frogs with every kind from jumpers to bull frogs seemingly everywhere this year. The last time they were seen in such great numbers was 1993 when they appeared after the spring flooding along with hundreds of tiny painted turtles. 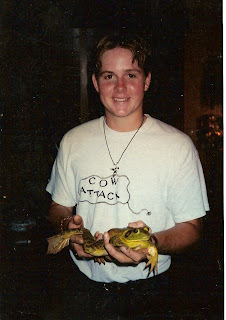 They were also notably prolific in 1983, the year we gave tadpoles as favors for a June birthday party. My friend above, Mr. Toad, has lived here for over 20 years. It is good to see them making a come back, especially since frog populations have declined dramatically since the 1950s… the reasons are entirely environmental. The earliest fossils indicate frogs existed 125 million years ago so they are a mirror of the environment. Oxygen is dissolved in an aqueous film on a frogs skin and passes from there to the blood and for this reason the skin must remain moist. Unfortunately this process can mainstream toxins into the bloodstream which is part of the source of their decline. Also their eggs are subject to water pollution and no adaptation may protect them from man made poisons. A true amphibian, frog eggs are laid and fertilized in the water and it is in the pond that young hatch and begin to morph. They appear first as tadpoles then gradually change into young frogs by losing their tail, losing their gills, developing lungs, and finally developing their fabulous hind legs. There are differences between frogs and toads, even though the toad is part of the frog family; the toad has adapted far better than his cousin, the frog. The frog insists upon a pond to lay her eggs however the toad is not particular and may lay eggs in a standing puddle. The hind legs of a true frog are highly unusual and better suited for leaping than walking; the hind legs of a toad are shorter and well suited for hopping. A toad is not dependant upon water, has warty skin, and a shorter more muscular face. He also has survival tactics against predators which the frog lacks. 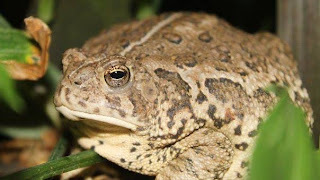 A toad may inflate his body, play dead, or secrete an unpleasant tasting chemical through a gland behind his eyes. The smooth skinned frog has only the ability to leap long distances away from predators. It is a myth that toads may pass their warts to humans; the warts belong to them alone. The tiny toadlets (baby toads) hiding among the flowers this month are harmless and make adorable playmates for the day… remember to release them by evening. The males of the family have the voice and will begin their evening song during mating season. 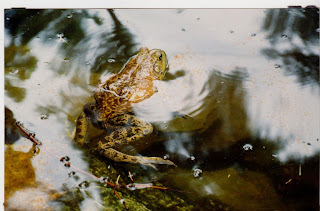 From the deep baritone of the Bull Frog to the sweet squeak of the little jumpers, their song is familiar to nightfall and highly anticipated by all who love an evening serenade. The frog hibernates in winter and tends to stay in the same home-place for the duration of their life. Some species may live up to 40 years so you may well see your old familiar friends in the garden for decades.